The Electric Frog & Pressure Riverside Festival celebrated its fourth edition yesterday at Glasgow’s Riverside Museum. With DJs including Sven Väth, Ben Klock, Rødhåd and Laurent Garnier plus SLAM and Gary Beck, this was a tremendous start to the May Bank Holiday weekend. 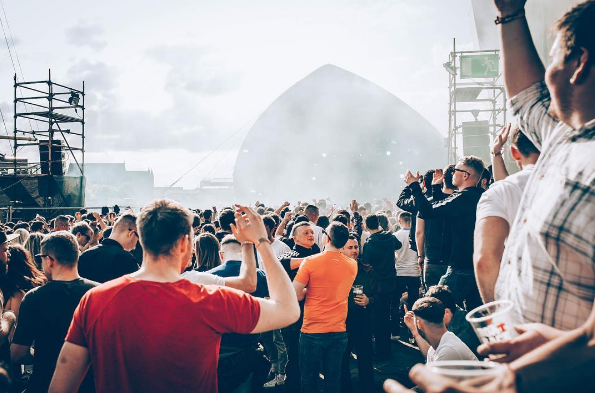 Saturday saw sets from Laurent Garnier and Cocoon’s Sven Väth proving extremely popular, whilst SLAM and Ben Klock created a euphoric atmosphere around at the stage on the banks of the River Clyde. Other highlights included the new food and drink areas, which allowed a lot more access on the site, with some great food and drink on offer, including a nicely chilled Heverlee Beer. The festival continues today with Fatboy Slim the main headliner and this day has already sold out. With the weather set to be another glorious sunny day, those in attendance can also catch top sets from Dimitri From Paris, Jackmaster, Dixon Avenue, Basement Jams, Kerri Chandler, Mash, DJ Deeon and Harri & Domenic. Check out some of the live broadcasts from last night, compliments of Room Two here, including the closing few minutes on the stage right beside the River Clyde. Awesome stuff!